It’s been a week since the Christmas party at the Alz center. So I’m not teary anymore. I wonder if I’ve put off writing a post about it for fear I’d go back to that melancholy place. The party was a day after a difficult experience at work, and my reaction to that bad experience had been rage on the day it happened, and sadness the next day. During a conversation with a work friend on Friday morning, I unexpectedly started to cry. Mom’s party was just a few hours later, so I arrived already feeling a little raw. And then Elvis started singing Annie’s Song. That melody gets me every time. I’ve actually been humming it this morning. As he sang, and I sang along, I noticed my support-group friend across the room, dancing with his wife. She had gone to stay with a daughter in Florida for seven weeks, but fell there and had to come back to Columbus, and to the Alz center. I was so proud of him when he had moved her to the center several months ago and worried when I didn’t see her anymore – until the staff said she had moved in with a daughter. (Later at the party, he told me, ‘She’ll be here for good now.’) The song, my friend dancing, holding hands with Mom and singing in her ear – it all got to me a little but I was able to keep the tears from actually streaming down my face. It even makes me feel sad about the loss of John Denver when I hear that song. So that wasn’t helping. Elvis carried on with Christmas songs, and volunteers dressed as Santa and Mrs. Claus made the rounds to hand out gifts and take pictures with residents and family members. It’s always hard to get Mom to look at a camera these days. Eventually Mom got restless and we walked around a little bit. We paused to have a brief dance during a fast song. I carried around her gift – a brown teddy bear. I sensed Mom was ready for a break, so I led her to a couch and coaxed her to sit down. By instinct, she reclined. I rested the teddy bear against her belly, and she immediately closed her eyes – probably trying to shut out the noise and the crowd. 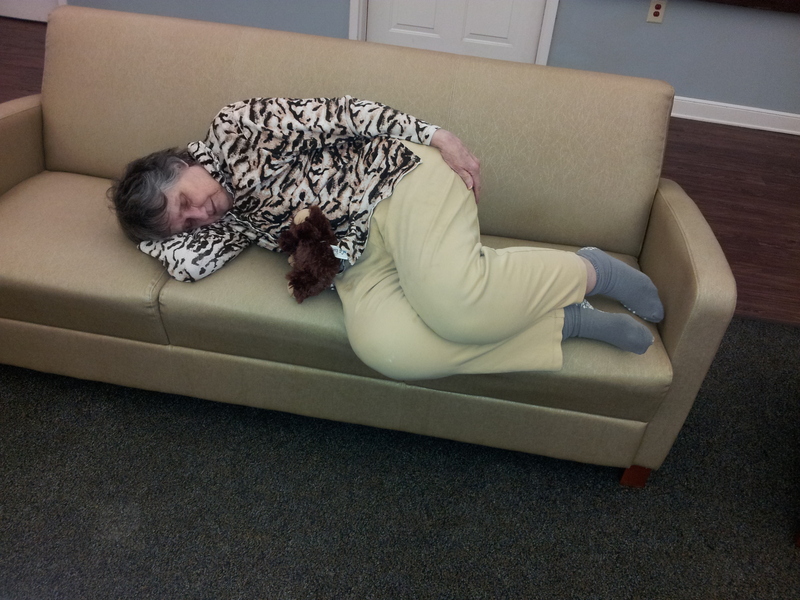 Resting after the Christmas party – just as she did last year before it was over. I was glad to get to the party this year (last year a work meeting delayed me until it was essentially over) but I did have to return to work to finish writing a story. I think the earlier tears actually helped me focus at this point – being able to work out some emotions saved me from stewing, saving me from myself. In general, studies on Alzheimer’s prevention offer no conclusive information on steps we can take to fend off the disease. Genetic predisposition is one (not fully understood) part of the problem. And aging itself is the primary risk factor for Alzheimer’s. But analyses to date suggest that the things people do to keep the body healthy are pretty much the same things that are believed to keep the brain healthy: regular physical exercise, a balanced and healthful diet, positive social interactions, and puzzles and games that function as exercises for the brain. I am not excessively worried about my own risk for Alzheimer’s. The statistics about it are so grim, and so many cause-related facts are still unknown, so I figure I’m as likely as anyone to end up with dementia. But still, since Mom’s diagnosis, I’ve taken my exercise regimen up a notch with hopes that blood flow to the brain is as good for me as stronger muscles and a healthy heart and lungs. The briefing was led by Jessica Langbaum, Ph.D., associate director of the Alzheimer’s Prevention Initiative in Phoenix and principal scientist at Banner Alzheimer’s Institute. She described the statistics – 5.2 million current American Alzheimer’s patients, with that number expected to triple by 2050 – and discussed other general information about this particular form of dementia. One tidbit was new to me, though had I ever thought in these terms, I guess it’s something I already knew: Alzheimer’s is the only top-10 cause of death that can’t be prevented, treated or cured. BAI has created the Alzheimer’s Prevention Registry to help accelerate clinical trials emphasizing true understanding about how this disease can be prevented – assuming it can be prevented. The registry is a community of people willing and ready to take part in prevention research. Those who sign up receive regular email updates on research and scientific advances and, most important, notices about upcoming studies and trials and how to participate in them. Signing up does not equal a pledge to participate, nor does it mean registrants’ personal information is automatically released to any scientists – it simply gives researchers a leg up on recruitment for their studies by creating an existing pool of people who have declared that they are willing to give a clinical study a try. Dr. Langbaum noted that according to the National Institutes of Health, 85 percent of trials face delays because recruitment is so tough. Many studies about Alzheimer’s in particular fail to meet recruitment goals. Research in this area can take many forms: surveys, one-time visits or a clinical trial involving an experimental drug, diet or exercise program. Two large national studies will begin enrolling participants soon. Most prevention research to date has been based on short-term studies or large population-based analyses. But what lies ahead could yield the best results: clinical trials in which people are randomly assigned to diet and/or exercise and followed for long enough to determine whether a healthy lifestyle can delay the onset of Alzheimer’s disease or another dementia. For now, Dr. Langbaum said, clinicians say that with regard to diet, what’s heart healthy is brain healthy. And exercising seems to lower dementia risk, and certainly cannot hurt. This registry is not limited to people with a family history of Alzheimer’s. Most clinical trials require control groups of healthy people unaffected by the disorder under study for comparison purposes. The registry is open to anyone age 18 or older with or without a family history of this type of dementia. The initiative was launched in May 2012 and by Nov. 13, the date of this briefing, 22,000 people had signed up. BAI’s goal is for 100,000 registrants by the end of this year. I am a believer in research participation. I was involved in a five-year study about nearsightedness and a more recent 12-week study about the effects of sesame oil on cardiovascular disease risk. I also enrolled in a trial investigating the risks of Alzheimer’s caregiving on caregivers’ health that involved only completion of a long questionnaire and a large blood sample. Mom participated in two drug studies shortly after she was diagnosed, but had to leave the second trial because of problems maintaining the protocol when she moved into assisted living. 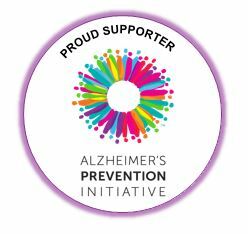 I have signed up for the Alzheimer’s Prevention Registry; the link is http://endAlznow.org. If you’re interested enough to read this, I’d recommend that you consider signing up, too.